A Kid Hereafter at Vesterbro Festival. 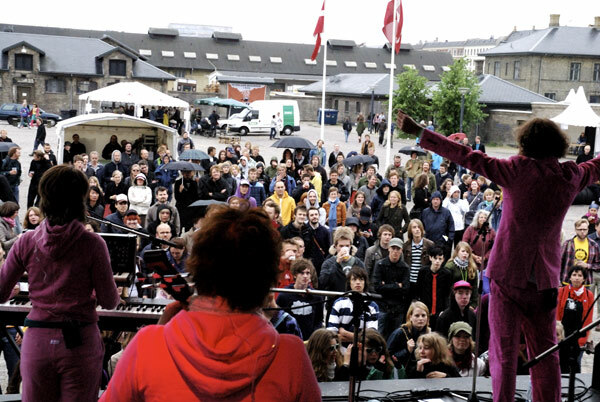 A good time was had by all those who dared to brave the cold Danish rainy summer day. Hearts were warmed immediately as AKH jumped into their show all clad in happy pink outfits, except of course the shadow. The nice thing about the Kid shows is that everyone has a smile on their face. It seems A Kid and crew are deemed to be the ultimate pre-festival band having turned all the right heads at their Pre-Spot gig. Come on lets do Pre-Roskilde. 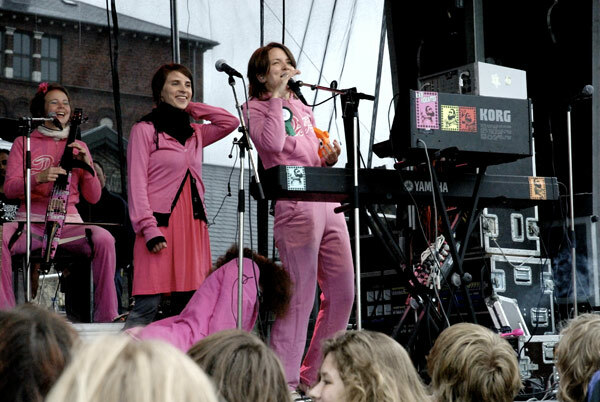 These cool women are having fun on stage and this photo by Mikkel Rønne captures that. From right to left we have Captain Woman a super talent, her sweet sister, Miriam my Muse, and on the far left the classical charmer, Hanna Headbanger. These intelligent women have talent, beauty and attitude. They keep a watchful eye over the boys in the band, who in general, considering their ages, are very immature and drink too much. Thats why they dress in pink, to calm things down. The Shadow in black, as the wild card, is very mature.